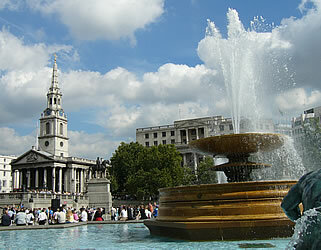 A brief guide to London's Trafalgar Square. 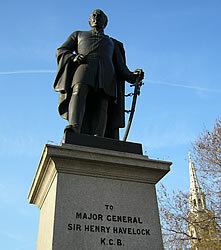 Horatio Nelson was the British admiral who commanded the British fleet at the time of the wars with the French leader Napoleon Bonaparte. The Battle of Trafalgar was between the British navy and combined French and Spanish forces and took place in the seas off south-west Spain on 21 October 1805. Although Nelson was killed on his ship (HMS Victory) near the end of the battle, he achieved a decisive victory in which 22 of the enemy's 33 ships were destoyed without losing any British ships. This made it impossible for Napoleon to invade England by sending his army across the English Channel. 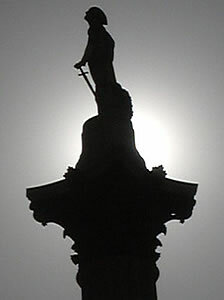 In Britain Nelson was considered to be a great hero, so when a new square was created in central London it was decided to include a tall pillar with his statue at the top, known as Nelson's Column. 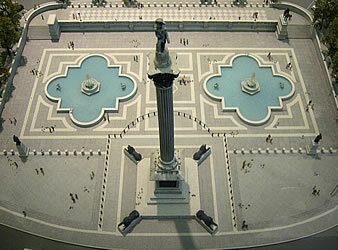 This was completed in 1844. 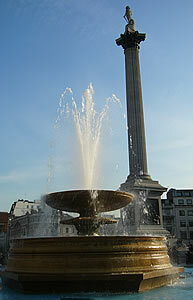 The square was named Trafalgar Square in memory of the battle. Bronze reliefs at the base of the column show scenes from four of Nelson's battles. 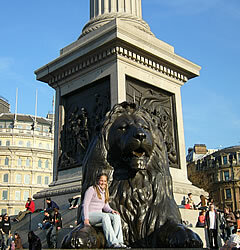 Four bronze lions were placed around the base of Nelson's Column in 1867. 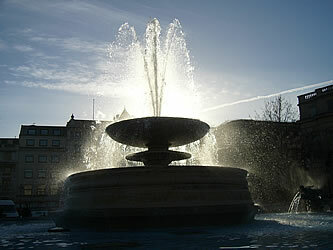 Two large fountains have been part of the square since 1844. 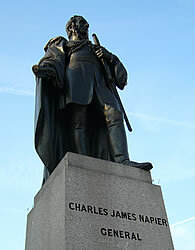 Statues were added in 1948. 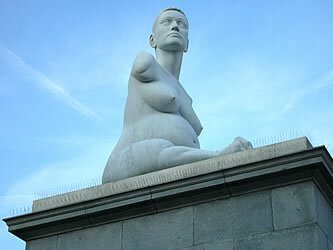 - "Alison Lapper Pregnant" by Marc Quinn, showing a heavily pregnant lady with no arms. 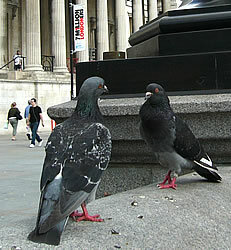 Pigeons often gather in the square, but please do not encourage this by feeding them. 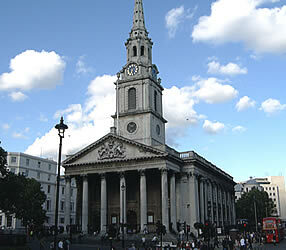 St Martin-in-the-Fields is a church on the north-east corner of Trafalgar Square. As well as church services there are many concerts performed here. 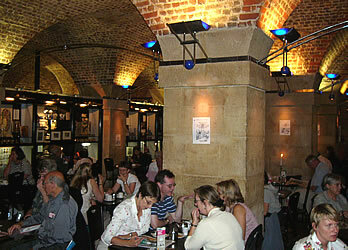 Beneath the church is a crypt which contains a café and brass rubbing centre. 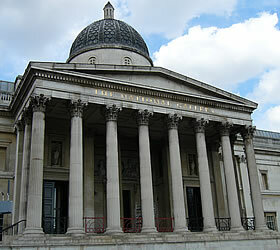 The National Gallery contains an impressive collection of Western European paintings. For example, you can see paintings by British artists such as Constable, Turner or Gainsborough, French artists such as Monet, Seurat or Renoir, Dutch artists such as van Goch, Rubens or Rembrandt, and Italian artists such as Leonardo da Vinci, Botticelli or Michelangelo. There is free entry to the permanent exhibitions, but tickets are usually required for the special temporary exhibitions. Photography is not allowed inside the gallery. 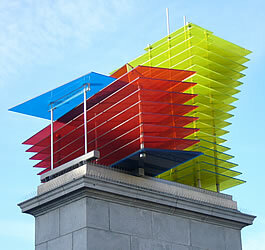 There are three connected parts to the building. In the centre is the main Portico entrance. 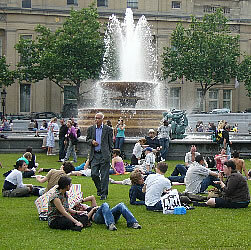 The entrance to the Sainsbury Wing (opened in 1991) is to the left and the Getty entrance for the East Wing is on the right. The gallery is open daily until 6pm, with late opening (and often a free classical concert) each Friday evening until 9pm. 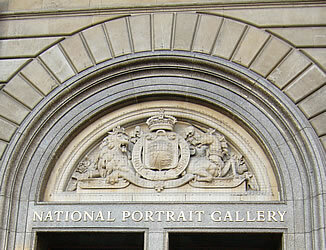 The National Portrait Gallery, established in 1856, is located on the north-east side of the National Gallery. 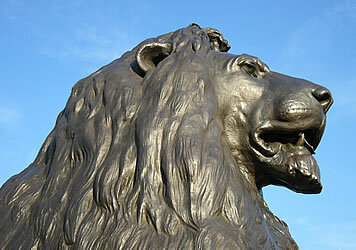 It contains a collection of portraits. Entry is free, but there are charges for the special exhibitions. Late opening is on Thursday and Friday evenings. Photography is not allowed inside the gallery. 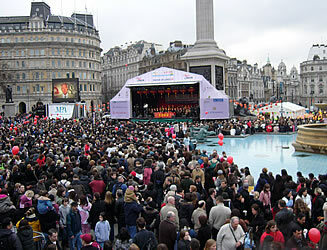 Free public events and performances are regularly staged in and around Trafalgar Square, especially at weekends. 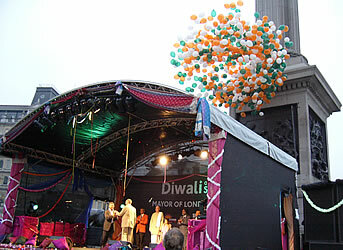 Many of these events reflect the multicultural nature of London's population. 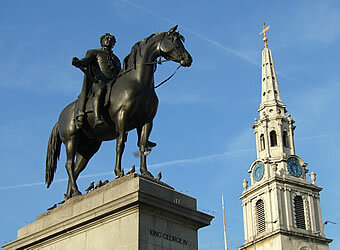 - Bus: many buses pass close to Trafalgar Square. It is also a starting place for many of the night buses.